the other is an atheist. 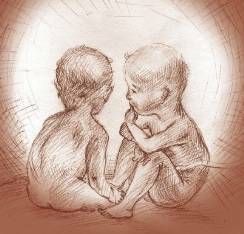 The Atheist: Do you believe in life after birth? grow strong enough and ready for what awaits us next. the cord, and it is too short. The Believer: I am sure it�s possible. It will be just a little different. It is possible to imagine. The Atheist: But there is nobody who has ever returned from there! Life simply ends with the birth. And frankly, life is just the one big suffering in the darkness. our mother and she will take care of us! The Atheist: Mother? You think we have a mother? So, where is she located? we move and live! Without her, we wouldn�t exist. our real life will begin only after the birth. How to determine the cause of overeating.